3.8 out of 5 based on 38 bloggers and 3 commenters. 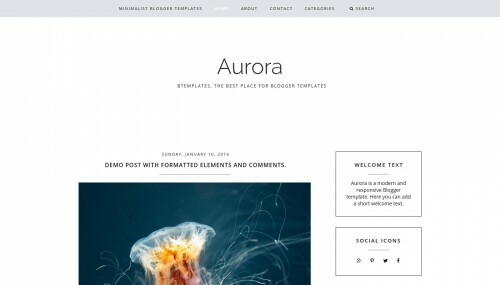 Aurora is a free premium blogger template with 2 columns, responsive design, seo friendly, right sidebar, minimalist, an exclusive design for Blogger, ads ready, footer columns, social bookmarking icons, drop down menu, related posts support, well designed threaded comments and simple look. Excellent template for blogs about books, business, fashion, health and beauty, photography or a personal portfolio site. Hi! I’m using this template, but there are some things that are not working. Is it possible to talk to someone from BTemplates for help?? How can I display “labels” in the sidebar?